Brian McGrory ’84 and The Boston Globe began their love affair more than 40 years ago in Weymouth, Mass. : He as a paperboy, and the Globe as his paper. “The only thing I ever wanted to do was write for a newspaper, and the only paper I ever wanted to write for was The Boston Globe,” he told a Bates audience last week. While McGrory’s passion for the Globe has long since been requited — he’s been a Globe reporter, columnist, metro editor, and, since 2012, editor — the paper’s relationship with its readers is at an “incredibly awkward” moment, he said. On the one hand, print subscribers pay a premium to have their newspaper arrive as regularly as the rising sun. 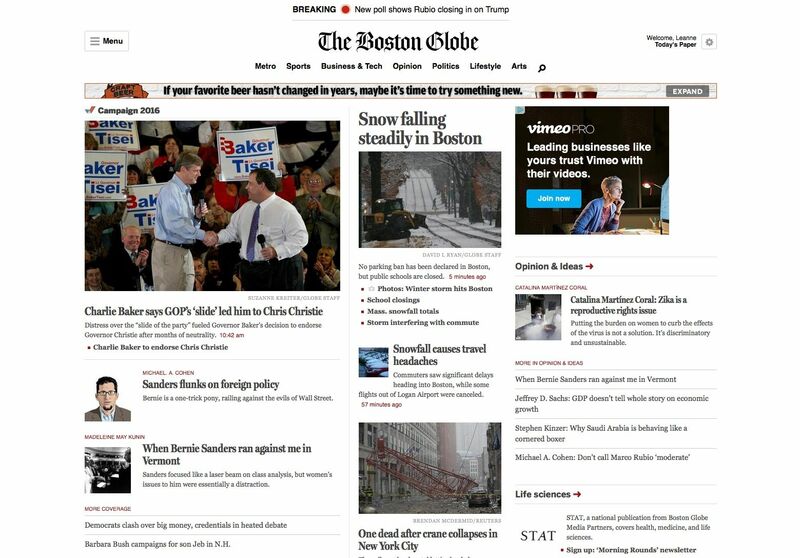 While the print circulation has plummeted, The Boston Globe has more readers than it’s ever had. But it’s not making much money from its large online readership. “We have to nurture what we can get from print,” said McGrory, who was on campus as the College Key Distinguished Alumnus in Residence. Early in his remarks in the Olin Arts Center Concert Hall, McGrory noted how Bates helped him along the route from paperboy to editor. Back in the mid-1990s, about the time McGrory was the Globe’s roving national reporter, New England had recovered from a recession, and the paper was again feeling good, generating more than $100 million in circulation revenue and $300 million in advertising revenue annually. All that revenue once funded an “enormous staff” of 540 Globe journalists (now 280), a 13-person Washington, D.C., bureau (now half that), and foreign bureaus (now none). Nationally, U.S. newspaper print advertising revenues from 2005 to 2011 dropped from $50 billion to less than half that, and have been slipping 8 to 10 percent per year since then. Digital advertising is also falling, McGrory said. 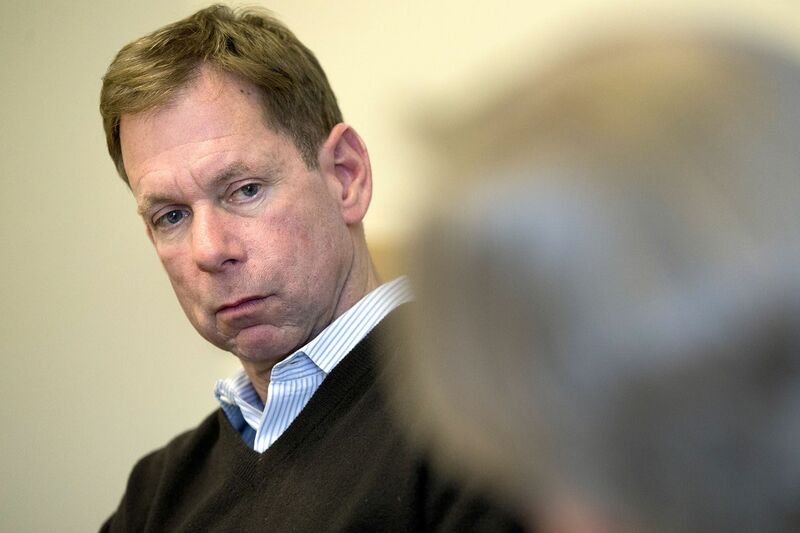 “You can’t compete with free,” McGrory added, mentioning Craigslist and similar free or cheap online sites to where the region’s Realtors, auto dealerships, and employee-seeking firms have fled. The print paper’s Sunday circulation has shrunk from around 800,000 in the mid 1990s to 250,000 today, and weekday circulation from 500,000 to 150,000. All those declines obscure an ironic fact. The Boston Globe has “more readers than we’ve ever had in the history of the paper,” McGrory says. Of the Globe stories he’s been involved with, McGrory says he’s most proud of the paper’s coverage of the Boston Marathon bombing. 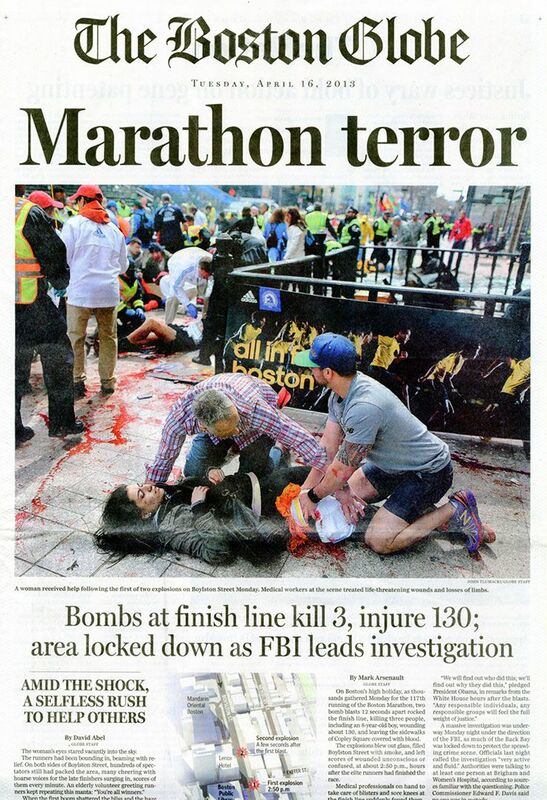 Seen here is the front page of the paper on April 16, 2013. The day before his visit, the Globe had 560,000 unique visitors to BostonGlobe.com and another 580,000 visits to the paper’s regional site, Boston.com. Digital subscriptions now top 70,000, the best among any regional newspaper. Problem is, “we’re having a really difficult time making money from them,” he said. Like any relationship fix, it will take a little of this, a little of that. He told the Olin audience about two papers that lacked those two qualities. If McGrory were the head of the Association for the Support of Drive-In Theaters, his lament might bring a shrug and a nod. Times change. But, says McGrory, more is at stake. Newspapers in general, and, in my experience, the Globe in particular, form a bond with the community in a way that no other provider can possibly do. We live in a crazy, polarized society where presidential candidates hurl themselves at each other rather than talking about policy proposals. We live in a divided country where cable news analysts are racing to be the most bombastic possible. It’s noisy. Washington is at a standstill. The tone, not only in Washington but the state capitols, is deteriorating. We, as the newspaper industry, are in the best position to make sense of all this. We alone can package all this information carefully, can be as fair as humanly possible, and add the context and respect that’s needed. In a crowded, jam-packed and violent world, we end up being an arbiter of what’s fair, what’s true, and what’s not. 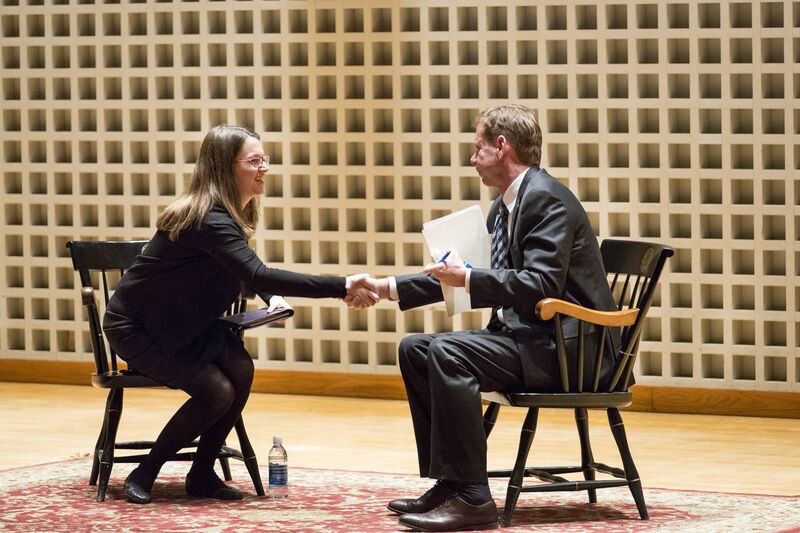 After his prepared remarks, McGrory, a political science major at Bates who was a Bates Student reporter, news editor, and features editor, sat for a Q&A with his counterpart on the Student, editor Julia Mongeau ’16 of Melrose, Mass. We made a commitment that night that we were going to be the paper that stuck with the Marathon story and told the victims’ story for a long time. We were not the national media who would come and go. We were going to be the arbiters of what was true and what was right and we would not rush to judgment. That has been a very proud moment that really stands out. I haven’t been here in 20 years. I’m floored by the sheer beauty of the campus, the way the college was able to integrate new buildings with old buildings, and turn old buildings into really useful buildings. [Roger Williams] used to be the dorm you wanted to live in for all the wrong reasons, and I always thought it was one April rain away from collapsing. It is now a stunning building. Bates is just a hot school right now. Everywhere I go I always hear about Bates. My friend’s kid is just desperate to get here. It’s a really desirable place for kids to get to right now.